Verden Gang - which translates to "World Affairs" is a Norwegian news paper. 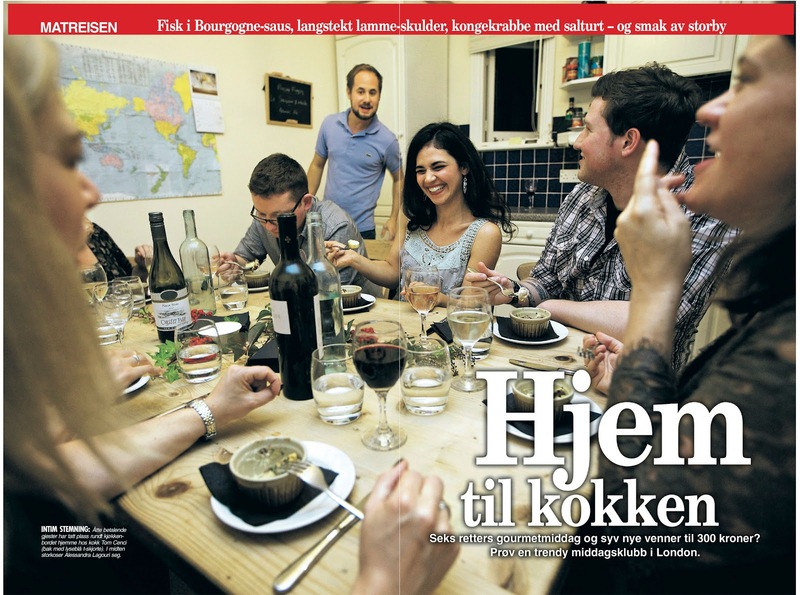 VG is one of the most award-winning newspapers in Norway for its journalism and has the second largest circulation there. It was established by members of the resistance movement shortly after the country was liberated from German occupation in 1945! The things you find out on wikipedia! Please excuse **woeful** machine translation by google translate! I've tidied it up but I have no doubt that parts will 'on inspections' (in joke between me and google translate - I've removed about 45 'on inspections') be lost in translation. It's not just about the food. This is London's premier check-place, says Tom about his cramped kitchen. It simmers in the sauce and the air is thick with the aromas of the wine, garlic and French cheeses. Boil-creases Tom Cenci (31) and Dan Do-herty (27) prepares classic French evening of allowable guests. A group of strangers paying a fixed price but worth noting this is no ordinary dinner party, but a dinner club, or "un-derground supper club" as it is called - We are head chefs in each restaurant was, but in that environment there's less chance to play with your products and try new things, explains Dan. "Supper Club" is perhaps the hippest food to eat in London right now, and ever new dinner clubs emerging as all the time. They range from the test premises of chefs with Michelin stars, to the kitchenette at home lonely-me housewives. Tom and Dan, who run the Chefs-London, is "in home variant" But thanks kokkeut-formation and good råvarekontakter, the duo have ray shining [SF: this sounds pretty good to me!] reviews on matblogger. An hour before the guests arrived-more, the small kitchen table is full as the ingredients are being prepared. - The first time we were nervous, now is the routine. Moreover, it should not be stiff. Guests will see us make ready the food, says Dan. One night on inspections visits Chefs London costs 35 pounds, or 311 kroner. The guys are not as Template A make money, just covered expenses. At the same time, they learn new dishes, building reputation, and meet new people. - There are so many singles, and most are women. It is a perfect place to check, [SF: Oi Oi Tom!] smiling Tom, and reveals that one of the guests are not completely unknown, however: His new flame to taste his food for the first time. While snails in the frying pan, guests are tumbling in and take matters into their on inspections [SF: I left that one in for a laugh] Toms kitchen brought wine. A scant fifteen minutes later, the kitchen is chock-full. While Tom and Dan cook, smatter guests in a dip of white beans and drinking wine [SF: Tom's at it again! ; )] - I live in a fairly closed environment, where all the musicians. Here, I meet people I otherwise never would have talked to, says composer Philip Ash-worth. 28-aring agree with matblogger and table-woman for the evening, Fiona Maclean (51), that the snails [SF: post on snails coming soon! The question is, do snails have teeth?] are excellent (and less threatening looks host snail outside their houses, soaked in sour cream and hidden among fungi). 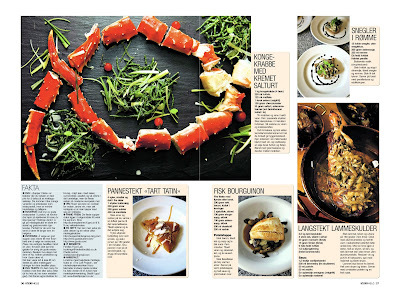 Five French cuisine (and a few bottles of wine) later, the guests exchanged phone numbers and Tom's new flame, Swiss Alessandra, has given the food a thumbs up. SKY: Simon purifying the lamb jus, for a dish that's adopted the nickname "marry me lamb", after a happy, male guest, asked about Simon's hand because he liked food so much! Wife rolling her eyes! Chef Simon Fernandez was one of the pioneers of Supper Club trend, and a regular in the top ten charts. Since then he has taken the concept one step further and started what londoners call a "pop-up restaurant" in a wood panelled ballroom in East London. When VG weekend visit ferdiesfoodlab the mood in the kitchen was bit more frenetic than at the home of Tom and Dan. 37 hungry guests waiting in the foyer, and even though Simon has two chefs and three servi-tors, it has become a race against the clock. - My God, this is not good for the nerves. But the passion for food is and the interest is what drives me, he explains. Four different desserts, including chocolate with dark chocolate and black olive, quit the party. - such places as ferdiesfoodlab you can really taste the father of new and exciting food, says guest Tom Ledwidge (34) satisfied, and stroking himself on inspections of his round belly. ● WHAT: "Supper Clubs" are clubs where you pay a fixed price to attend the a dinner party. They come in as many varieties and price ranges as restaurants, but is less formal and less expensive. ● WHY: There are many good restaurants in London, so why go to a home kitchen to someone you do not know? 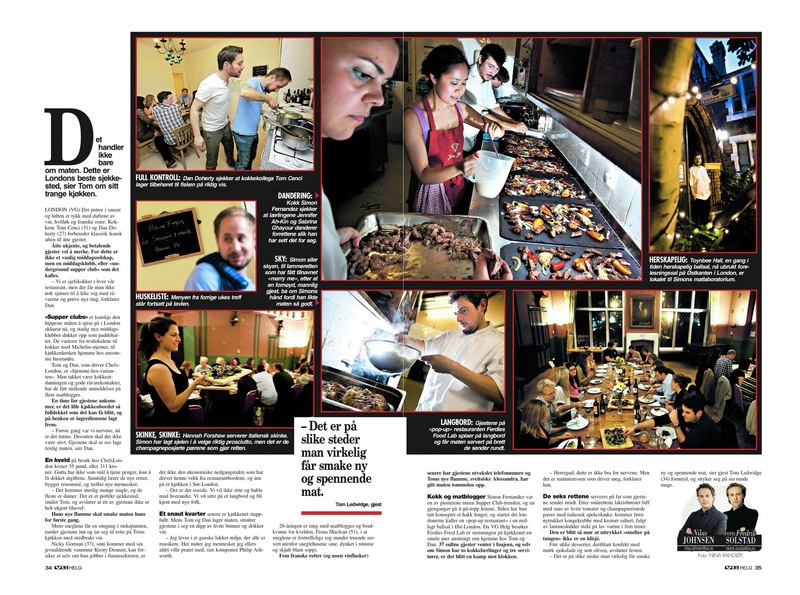 That's why: Supper club is bathing in a social and gastronomic experience. Perfect for those who intend meet new people on the weekend. ● HOW: to select a good supper club requires a little more preparation, cooperation than to choose a restaurant. Space must have usually booked at least one week in advance (as is the case of the good restaurant). Decide what kind of food you want, what price range and where in the city you want. You may want to judge read a bit about the place on different matblogger / kåringer before you book space. ● WHAT IS PROVIDED: A set menu for the evening with five or six dishes (say if you have any allergies). There are separate clubs for brunch, "high tea" with cakes, curry nights, Asian, and went on for ages, but most focus on inspections of modern European cuisine. ● VIN: Some serve a cocktail before dinner, some wine, but the most common is that you buy with a wine bottle. ● Collect: Most supper clubs located in suburbs slightly away from the centre. Use http://journeyplanner.tfl.gov.uk to judge the directions. With many thanks to Nilas and Fredrik for their permission to use their work on the blog! Cous cous is one of those foods that can be mind numbingly bland. In the hands of any would be - or accidental - food assassin, it could have everyone around the table slumped over with their tongue handing out, bored to death. First time I tried this was at Marc's house. (old school friend) I think I was 7 or 8 years old! I'd never seen anything like it, and filled my bowl with trepidation. I'm glad to say Marc's mum was no food assassin and I snorked my portion along with various other French bonne bouche that his mum had put out for us after a hard day's climbing! I've traditionally made cous cous with hearty winter flavours provided by roast vegetables and nuts, raisins and chicken stock. 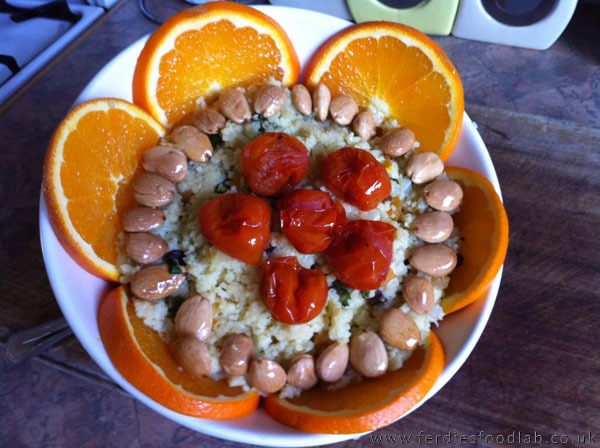 But orange juice used to make the cous cous - add a really fresh dimension, fantastic! This recipe is by my mum, and jolly good it is too . . .
- leave to cool a bit, coat in honey and sprinkle with salt. Stew cherry toms (I do mine in the cast iron pan with a bit of oil and salt) until very soft. Remove and try to keep intact for decoration. Place cous cous in a bowl and add boiling water and salt to taste. Add a knob of butter and stir in. Warm the orange juice and reduce slightly – then add to cous cous.